I sat the letter down in my cubicle and avoided reading it for about an hour. 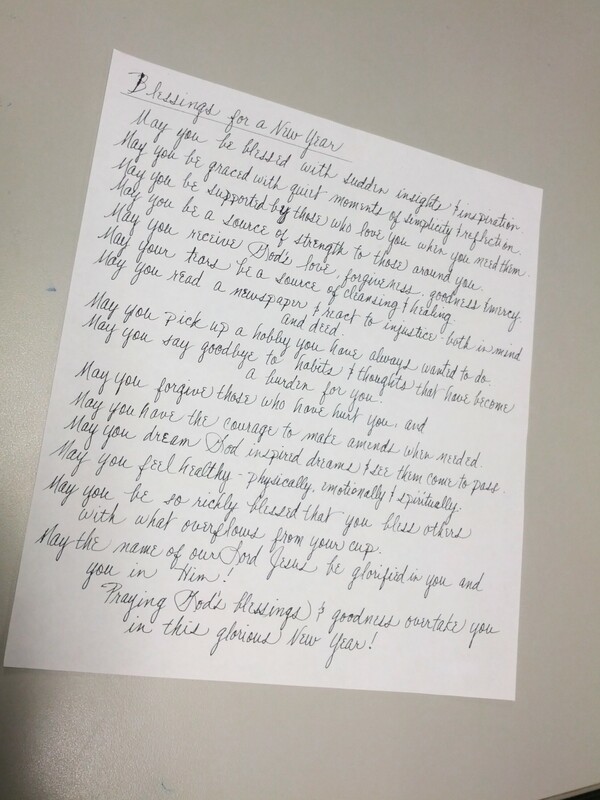 It was titled, “Blessings for a New Year”. At that point in my life I was questioning almost everything… It seemed like it took so much work to accomplish anything or get where I needed to be… I knew the direction I was headed but I was exhausted trying to get there. As I finally read through the page I had no idea how much the blessings would echo through my heart during the next year. May you be blessed with sudden insights & inspiration. May you be graced with quiet moments of simplicity & reflection. May you be supported by those who love you when you need them. May you receive God’s love, forgiveness, goodness, & mercy. May your tears be a source of cleansing & healing. May you read a newspaper & react to injustice- both in mind and deed. May you pick up a hobby you have always wanted to do. May you say goodbye to habits & thoughts that have become a burden for you. May you dream God inspired dreams & see them come to pass. May you feel healthy-physically, emotionally, & spiritually. May you be so richly blessed that you bless others with what overflows from your cup. May the name of Lord Jesus be glorified in you and you in Him! According to a blog post on January 3, 2014, I had a renewed hope for miracles, change, and life…by the end of April things had really changed in many unexpected ways…It is almost haunting for me to go back and read my blog post on April 17, 2014. This was posted 3 days before Easter…3 days before the separation…7 months before the divorce was final. I had written about forgiveness and wiping the slate clean…on Easter Sunday I was reminded that a clean slate does not guarantee an easy start…I thank God for the people He placed in my life to pray me through from fog to clarity. Father, bless the hands that hold onto ours in prayer, the eyes that look at us through our tears, and the arms that hold us until your Spirit warms our hearts. 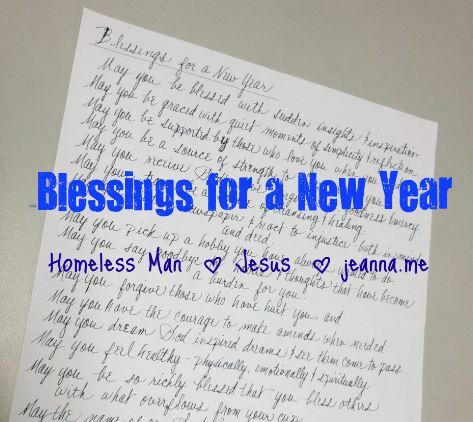 Father, give each person reading this right now a renewed sense of purpose in this new year. Give us discernment as we wait, increase our depth of insight as we listen, and hope when we pray. Help us to come alongside others without causing them to stumble. Help us to tell our story and teach us to listen with intention. Remind us of how great You are when we fail to be humble. Be with us in the moment, help us communicate to others how much they are valued. Show us where our hands can help and our prayers can heal. Guide us step by step as we mourn with those who mourn and celebrate with those who have found joy. Give us courage to move in action where You lead, and remind us to rest in silence when we should. Show us Your glory as we dare to live with a heart undivided. As I read through the Blessings for a New Year as shared with me and the words of Jesus as recorded for me and you…I am able to look at my 2014 and say, “yes, yes, yes…These things He did for me.” Hindsight allows us to see where choices lead and where fruit was produced. Resolve to live this next year with intention and hope. Thank you for journeying with me in 2014. I hold you in my prayers for 2015. May you look back in a year and see how God has blessed you. *I sheepishly admit now, that it is was a common concern for me that my kindness would be mistaken for romantic interest…so I was often on guard to be cold if someone seemed too friendly—often in human services we are taught to be that way, to protect ourselves from unwelcome advances…now I try to point out where my kindness comes from instead of running away. **I have seen versions of this online attributed to wise teachers…I’m still looking for one worded exactly the same as this. Let me know if you find it. Truthfully the origin does not matter too much to me, for I’ll always know this blessing as the one given to me by a homeless man with nothing but blessings to give…a wise teacher. This is the original letter of blessing passed to me by a man with no home. I want to thank you for your posts. My journey is just beginning and I spend much time stumbling and am often afraid to ask the godly questions that I have but I always read and am inspired that I too can have what you have found with Jesus. Thank you. Thank you for sharing that with me, Mary. God is crazy about you. We all stumble, we are human. I am overjoyed that you long to be closer to Jesus. Ask the questions, seek the answers. My own faith has been strengthened through quiet study, serving others, and constant prayer. If you haven’t already, I encourage you to find a church where you can ask questions and worship with other followers of Christ. Find believers that aren’t afraid to get messy in friendship, and remember that nothing is too messy for God.